A watch is more than just a piece of a personal accessory which tells you time. It reflects a matter of taste and a matter of class that the wearer belongs to. 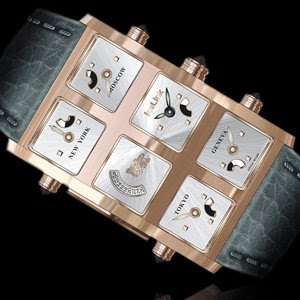 While creating a watch is a punctilious process, simply looking odd and complicated may not able to meet one's expectation. 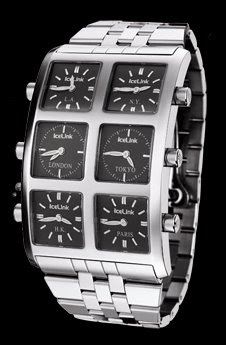 A jewellery expert from California, IceLink had brought the market a 6Timezone in 2007. However, an impact wasn't much created. By putting six individual minute quartz movement into one bezel, how impressive it would be. You know when it can be complicated, why make it simple? Luckily, Icelink is back on track. 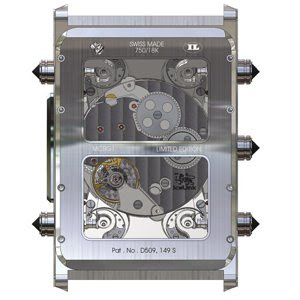 In 2009, they are able to find a partner whom can manipulate their mechanical movement in supporting a real "synchronized" 5-time zone in one watch. It is definitely a world first.